If you can only get buttermilk in the quart-sized containers and a recipe for buttermilk pancakes or chocolate fudge cupcakes only calls for about 1/2 of a cup, you are bound to have leftovers! Or what about a recipe, like my perfect buttercream frosting, that only calls for a few tablespoons of cream, or a recipe that you need a splash of whole milk for? Luckily, it is actually so easy to freeze the left overs for next time in, convenient measurements that you can thaw out as you need it. Label your bags with the ingredient and the amount (For example: "1/2 cup buttermilk" OR "1 Tablespoon Heavy Cream"). You can also add the date so you don't loose track of how long it has been frozen for. Buttermilk and cream can be frozen for up to 1-3 months. Portion out your leftover liquid into the bags. You can do this by pouring the liquid into a measuring cup and then pouring it into the bag, or using a measuring spoon and freezing the amount in an ice cube tray before transferring to the bag. This way, you have pre-measured small amounts that you can thaw depending on how much you need for the recipe. Seal the bag, pressing out as much air as you can and pop in the freezer. When ready to use, thaw the bag in the fridge or submerge it in a bowl or warm water, then stir the liquid very well once it has thawed, as it might separate once thawed. If you are adding the liquid to a hot pan, you do not need to thaw first, and can simply melt it into the recipe as needed. To bring milk and cream to room temperature quickly: microwave milk in 10-15 second intervals until no longer cold, stirring in between. Using cold milk can cause your batter to look curdled when added to the other room temperature ingredients. For a dairy free alternative: try using soy milk, almond milk, or coconut milk (rice milk will make your baked goods too dry, so try to avoid it in baking). When a recipe calls for milk, I always like to use whole milk or buttermilk, for a richer, more moist and tender baked good but 2% works too. Heavy cream, also called heavy whipping cream is the richest of the creams, with the highest fat content. Both light and heavy whipping creams will whip up into a nice sturdy whipped cream, while half and half (made of half milk and half cream) and light cream do not have a high enough fat content (30% minimum) to whip up into a nice fluffy whipped topping, but are great for using in baking or using as the liquid in American buttercream frosting recipe for a little extra richness. 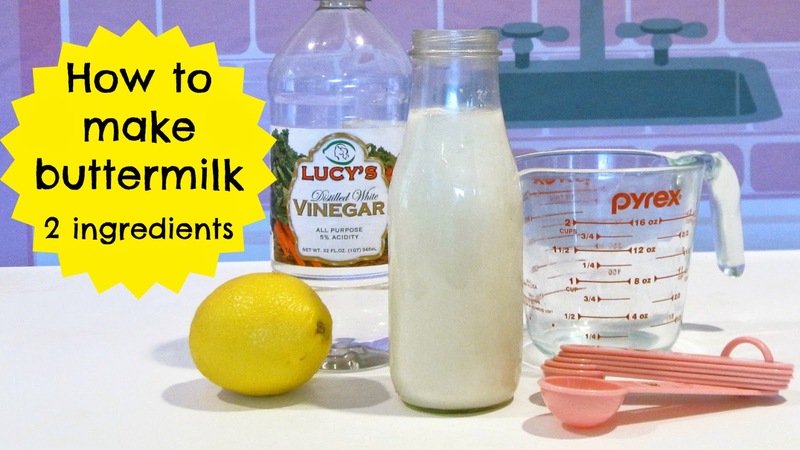 Half & Half Substitute: 1 cup = 1/2 cup light cream + 1/2 cup whole milk OR 1/4 cup heavy cream + 3/4 cup whole milk OR 1 1/2 tablespoons melted butter plus enough whole milk to equal 1 cup. I love to use buttermilk in baking. The acidity in buttermilk tenderize the gluten formation in your recipe, yielding a softer, more tender baked good. In addition to giving baked goods a nice texture, buttermilk also lends a rich tangy flavor. It usually comes in a low-fat variety these days and has a thicker consistency than regular milk. The fat content in the milk you use will affect the outcome of your recipe. The higher the fat content, the better flavor it will lend to your baked good. When using regular milk, I usually opt for whole milk for the richest, most moist outcome. If a recipe does not state which type of milk to use, generally if is safe to stick with whole or 2% milk. I rarely use fat-free or skim milk for baking. Homemade Whole Milk Substitute: 1 cup whole milk = 1 cup fat free skim milk mixed with 2 tablespoons melted unsalted butter or margarine.